Darjeeling: Tintin, one of the most endeared and celebrated cartoon characters of the world, turned 90 recently. However, the remarkable part is that he made a special visit to the 'Queen of Hills', Darjeeling, on his special occasion on January 10 this year. The Embassy of Belgium in New Delhi announced this in a Facebook post on January 10. "Tintin was created by Belgian 🇧🇪 cartoonist Hergé. Last year, Indian artist MAli's created a fan tribute to celebrate Tintin's birthday in traditional Bengali attire in front of the Howrah bridge in Kolkata. 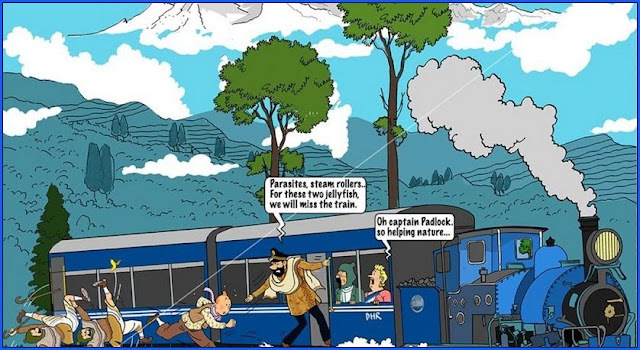 This time, the Bengalis in West Bengal suggested Tintin to go further north to explore Darjeeling," the post read. Meanwhile, Tintin's 90th birthday was marked by a controversy, with his Belgian creator’s heirs releasing a new edition of 'Tintin in the Congo”, a work from 1930 that draws accusations of racism. Tintin, one of the most endeared and celebrated cartoon characters of the world, turned 90 recently. However, the remarkable part is that he made a special visit to the 'Queen of Hills', Darjeeling, on his special occasion on January 10 this year.